Negligence is the breach of a legal duty to care. It means carelessness in a matter in which the law mandates carefulness. A breach of this duty gives a patient the right to initiate action against negligence. A doctor can be held liable for negligence only if one can prove that she/ he is guilty of a failure that no doctor with ordinary skills would be guilty of if acting with reasonable care. An error of judgment constitutes negligence only if a reasonably competent professional with the standard skills that the defendant professes to have, and acting with ordinary care, would not have made the same error. Act of a child above seven and under twelve of immature understanding by Section 83 of Indian Penal Code is that Nothing is an offence which is done by a child above seven years of age and under twelve, who has not attained sufficient maturity of understanding to judge of the nature and consequences of his conduct on that occasion. The Section 90 is on Consent known to be given under fear or misconception. A consent is not such a consent as it intended by any section of this Code, if the consent is given by a person under fear of injury, or under a misconception of fact, and if the person doing the act knows, or has reason to believe, that the consent was given in consequence of such fear or misconception; or Consent of insane person.—if the consent is given by a person who, from unsoundness of mind, or intoxication, is unable to understand the nature and consequence of that to which he gives his consent; or Consent of child.—unless the contrary appears from the context, if the consent is given by a person who is under twelve years of age. By Section 304A causing death by negligence is Whoever causes the death of any person by doing any rash or negligent act not amounting to culpable homicide, shall be punished with imprisonment of either des c r i p tion for a term which may extend to two years, or with fine, or with both. And by Section 337, Causing hurt by act endangering life or personal safety of others will be whoever causes hurt to any person by doing any act so rashly or negligently as to endanger human life, or the personal safety of others, shall be punished with imprisonment of either des c r i p tion for a term which may extend to six months, or with fine which may extend to five hundred rupees, or with both. Causing grievous hurt by act endangering life or personal safety of others is offence under Section 338 in which whoever causes grievous hurt to any person by doing any act so rashly or negligently as to endanger human life, or the personal safety of others, shall be punished with impris­onment of either des c r i p tion for a term which may extend to two years, or with fine which may extend to one thousand rupees, or with both. 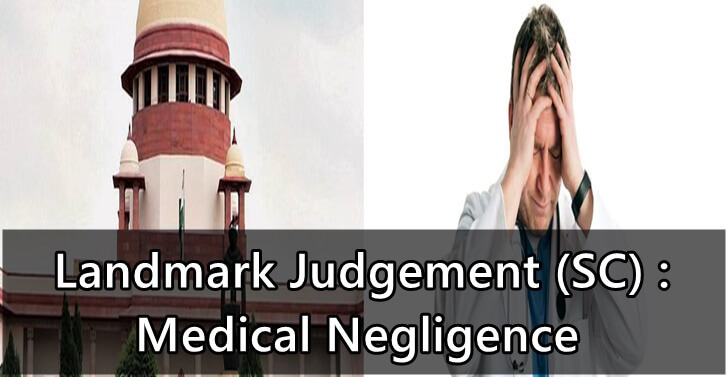 We have medical negligence lawyers in India.